Green Plants and Brown Pods? The picture below was take by Dr. Mike Weiss, showing a curious condition we are seeing in some areas. It has been brought about by the weather conditions we have seen this season. It is best to be aware of it and plan your harvest schedule accordingly. I also attached an article from Purdue giving some additional information. Please have a safe and productive harvest! Let us know if we can yield check any of your fields. WEST LAFAYETTE, Ind. 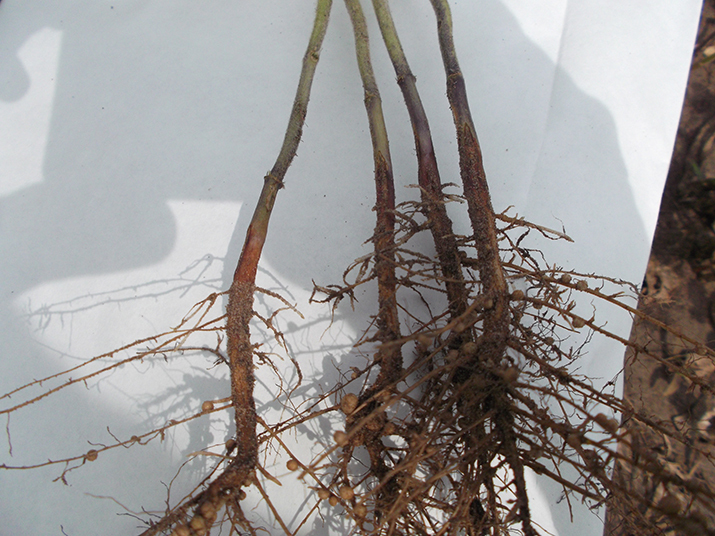 – Some Indiana soybean fields are showing symptoms of green stem syndrome, a Purdue Extension soybean specialist says. 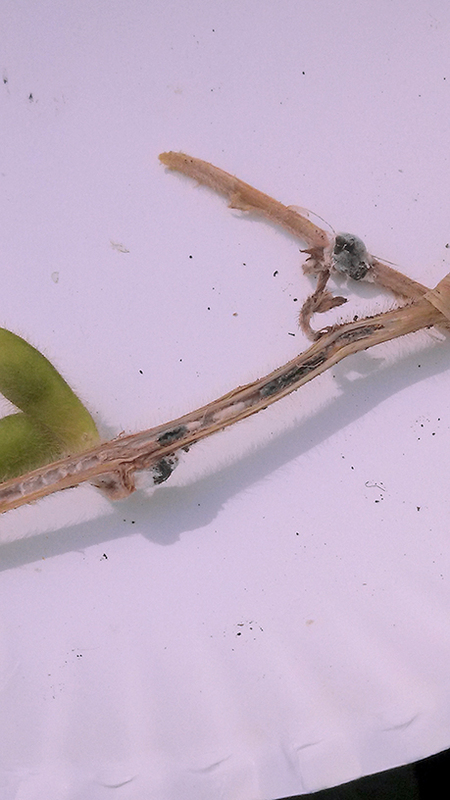 Green stem syndrome occurs when soybean pods and seeds mature – turning harvest color and drying out – while the stems remain green. 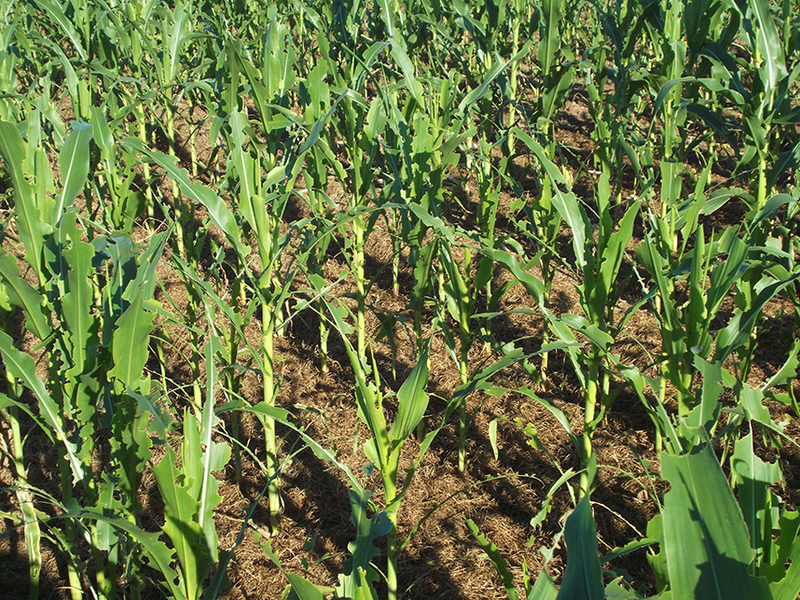 Late-season stresses that interrupt seed-fill, such as weather, the environment, viral diseases or insect infestations, usually cause the problem. Casteel said farmers should go into fields that seem to be browning and see if both the pods and stems are maturing. “This year with some of those green stem-type fields, producers need to take a look at the pods themselves and the grain to see if they are dry enough for harvest,” he said. Soybeans should be harvested at or slightly above 13 percent moisture to maximize yield, but green stems are tough to harvest. Casteel said producers with fields exhibiting green stem syndrome have two options. The first is to harvest the beans at optimal grain moisture to capture water weight. Doing so likely will slow harvest and increase fuel costs because of the green stems. “For harvest, be prepared to have to ‘chew’ through fields with green-stem syndrome with the combine, especially with older equipment,” Casteel said. Another option is to wait and harvest the plants when the stems turn brown. This option is easier on equipment but likely will reduce yield due to lost water weight. Delaying harvest for a few weeks also could allow the pods more time to dry out and possibly shatter. “Producers need to be aware that this phenomenon is occurring so they can make informed decisions about optimizing harvest and reducing losses in yield and profit,” Casteel said. The soybean harvest has taken off in the area. I just talked with a grower west of Galesville and they are opening up some fields as we speak. He said they are definitely dry enough and to plan on soil sampling everything early next week. Fall is a great time to get all of your soil sampling completed. A few key things to remember about sampling this fall: sample the fields prior to any tillage, and before any manure, fertilizer, or lime is applied. This way you get an accurate sample. A corn field was also recently harvested up this way, the moisture ranged from 16% to 31% and test weights from 49 to 52. Stink bugs damaging my corn? According to the following article from Ohio State, we can see injury in corn. See the pictures they provided in the article below so you can see what the damage looks like. The authors also mention that sweet corn is more prone to stink bug damage. Read the article below for further information and let us know if you think you spot some in one of your fields. Stink bug damage on corn. 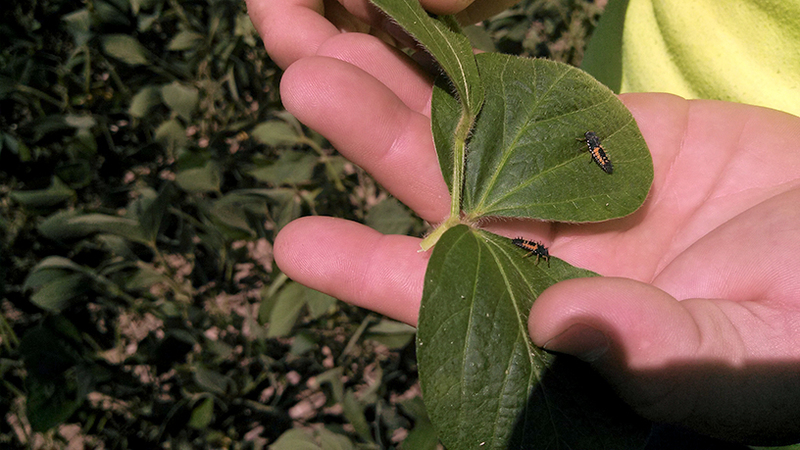 Last week we saw stink bug injury at the Northwest Branch near Hoytville and the Waterman Farm in Columbus. At Waterman, the damage was associated with brown marmorated stink bugs, but green stink bugs were more common at NW Branch. Damage was evident on husks where stink bugs appeared to be feeding (see photo). 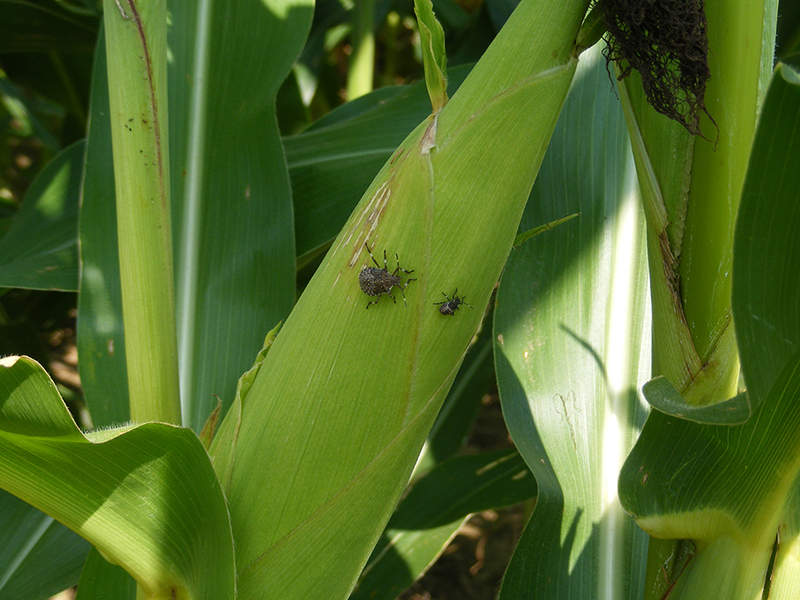 In the southern states, stink bugs cause significant losses in field corn. When stink bugs pierce through the husk and feed on the ear during early development, the cob will not develop on that side, but continue growing on the back side giving the ear a characteristic banana shaped appearance. The shuck will also stop developing, exposing the grain to bird and insect damage. Injury also includes shrunken and/or missing kernels. Heavy stink bug populations can reduce not only yields but also the quality of the grain. While we have not seen any economic losses from stink bugs in field corn, growers should be aware of their presence and the damage they can cause. 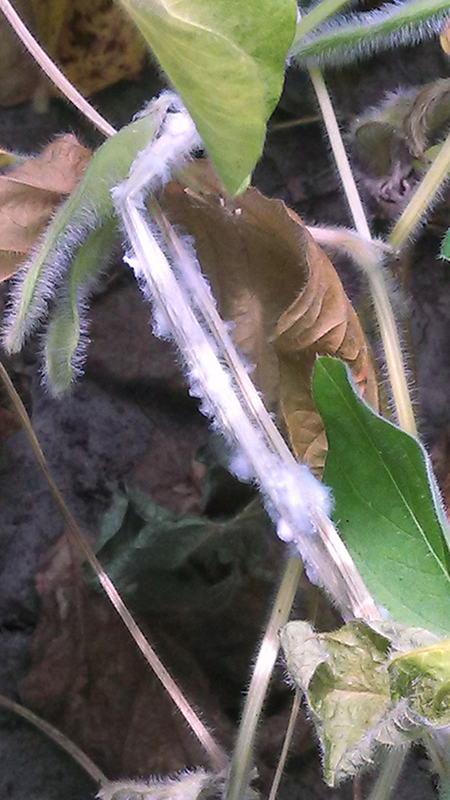 WARNING: WHITE MOLD FOUND in soybean fields! 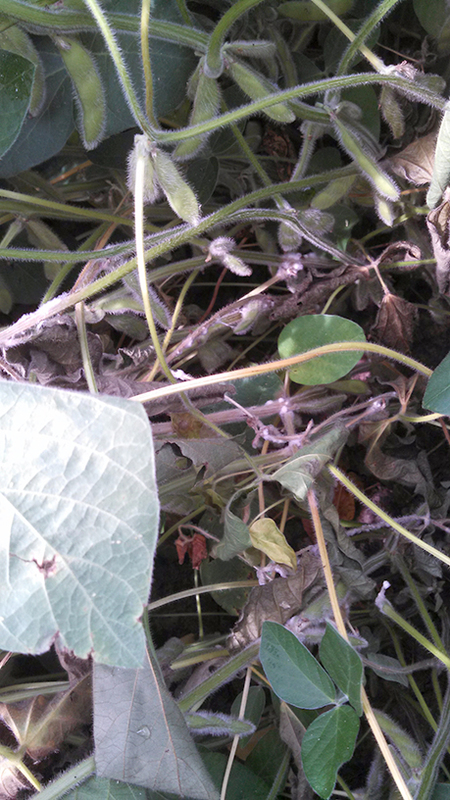 We have found areas of white mold starting aggressively in area soybean fields. It is too late to use the herbicide Cobra®, but you could us a fungicide such as Domark®, at 5 oz. per acre, to help slow down the progression of this devastating disease. It is also recommended to add in 6.4 oz. per acre of MasterLock® (a new premix of Interlock® and Preference®) to aid in the dispersal of the fungicide on the soybean plants. Below are some photos to assist you in determining if you have any white mold in your fields. (Click photos to enlarge them.) 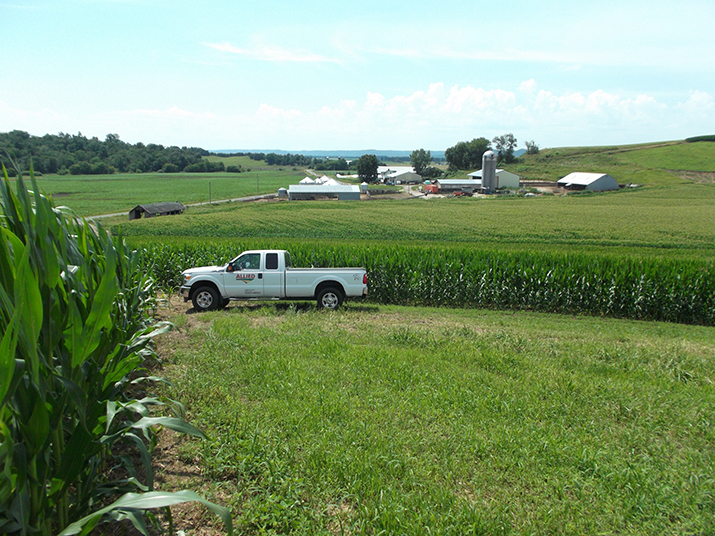 Please let us know if you need any help scouting your fields. Soybean aphids found north of Galesville today. 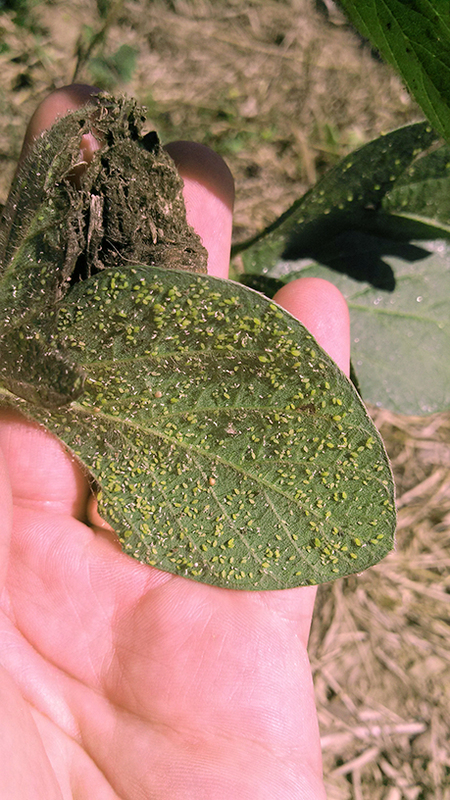 We were out scouting some soybean fields north of Galesville today and found some pockets of aphid pressure. Please remember to be checking your fields on a regular basis. On a related note, here is a pop quiz for the day: Is the insect pictured below a friend or foe? The answer? Friend! This little guy is actually the larval stage of the lady beetle. The lady beetle eats soybean aphids. Remember with the insects the stages are egg, larvae, pupa, and adult. Near Galesville today I found my first Western Bean Cutworm Egg Mass. The moth counts are very low this year. 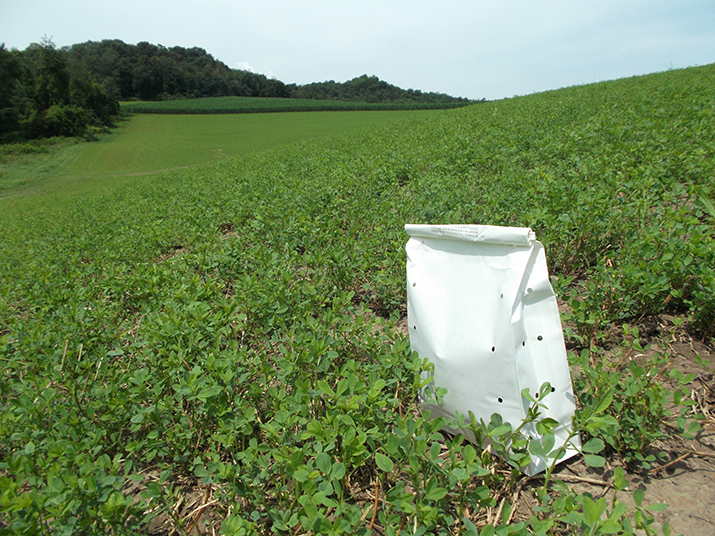 We put out 5 pheromone traps and have found very few this season. 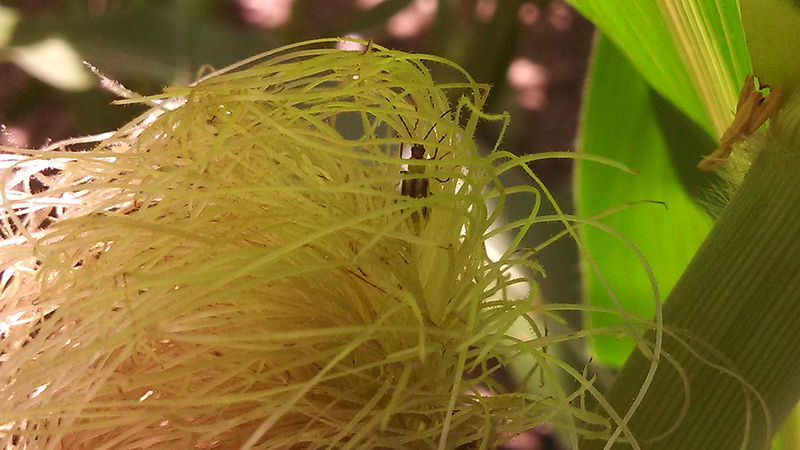 I also found a fair number of Corn Rootworm beetles feeding on the fresh silks today. 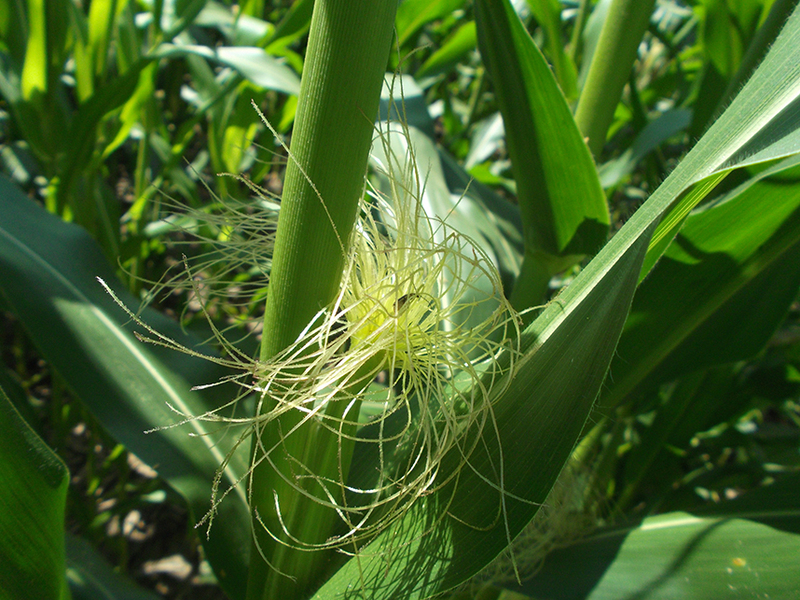 Please keep a watchful eye on your corn fields during the critical pollination phase. 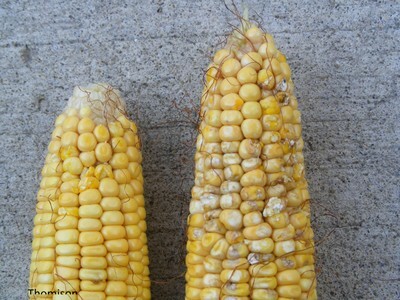 The published threshold is “when silk clipping is occurring on 25% or more of the plants during pollen shed.” Also, if this field will be corn next year, it is best to plan your management strategy to combat this pest now due to the fact that they will be laying eggs now to attack next year’s corn crop. Please let us know if you have questions on any of these issues. Thank you. Western bean cutworm egg masses. Our black light traps are showing low to very low levels of western bean cutworm moths, European corn borer, and corn earworm, especially compared to the levels we were finding this time last year. We have found a few corn leaf aphids on some of the heavier ground in our area so be sure to be monitoring your fields for this pest as the summer progresses. Much of the corn in our area is at the tail end of pollination and is looking good. Low levels of rust can be found in most all of the fields in our area. 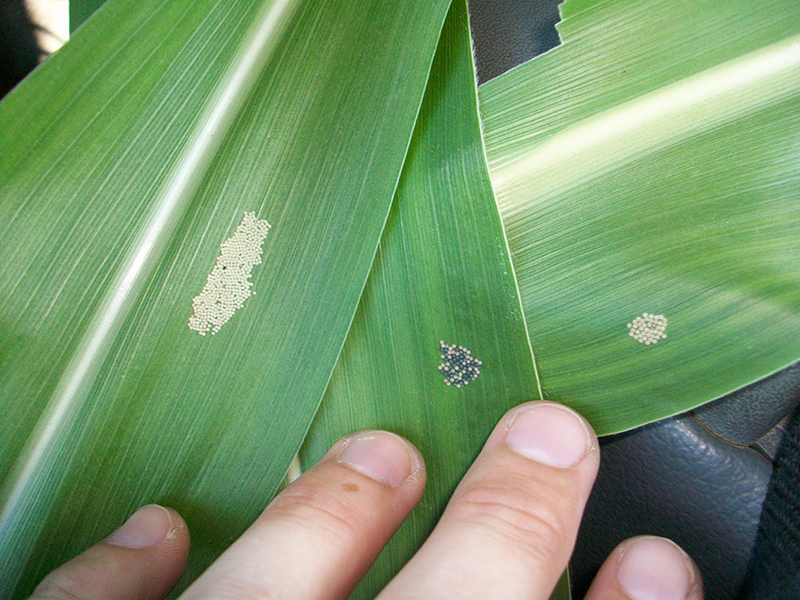 Anthracnose leaf spot is common in fields that are corn after corn. We have only found a few fields with trace amounts of Northern corn leaf blight to date, but with wet weather on the forecast it is likely to spread. Japanese beetle, green clover worm, aphids have been the main insects we have been finding these past few weeks, but no fields have reached economic thresholds yet. Be vigilant in scouting for aphids as the extended forecast of cool weather will be very conducive to aphid reproduction. University thresholds are 250 aphids pre-plant which may sound like a lot, but when the population can double every few days it does not take very long for a field to become infected. Septoria brown spot is slowly building in the lower canopy of many of the soybean fields in our area. Consider a foliar fungicide if you have moderate or heavy disease pressure at this time. 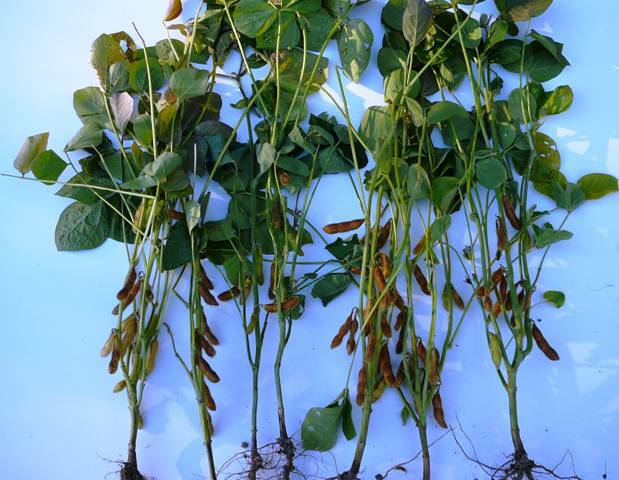 The key time for fungicide on soybeans is the R1 (beginning flower) to R3 (beginning pod) stage. Many of our fields are in the R3 stage to R4 (full pod). Late blight continues to be a problem and is slowly but surely spreading with each week, bringing one or two more fields found to have been infected. So continue to apply fungicide on your scheduled interval being sure to add premium late blight material especially on the weeks of cool wet weather like we have been having. We are currently in the midst of second generation Colorado potato beetles with adults already laying eggs and larvae hatching. Some of the petiole numbers are starting to crash as the crop begins to pour energy into the tubers. We have been checking tubers for shape and size last week and this week to see if an MH30 application is needed to correct the shape of the tubers. 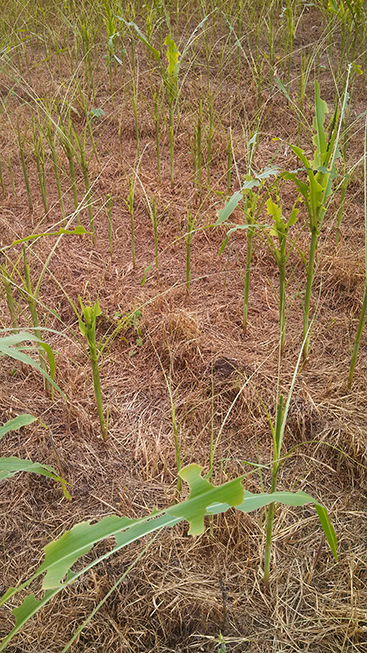 Please keep a close eye on your corn fields, especially those with a lot of trash or weeds. These photos taken by Wayne Roemer, an Agronomist out of our Plover location, show the extreme damage they cause. Wayne took these photos 8 miles south of Waupaca. Sally Turpin, an Agronomist out of our Mauston location, also found a heavily damaged field just north of Mauston. This pest moves rapidly and can leave only the stalk and mid rib on the corn plant. It is important to spray before the damage gets this bad. Please let us know if you need any help checking your fields. 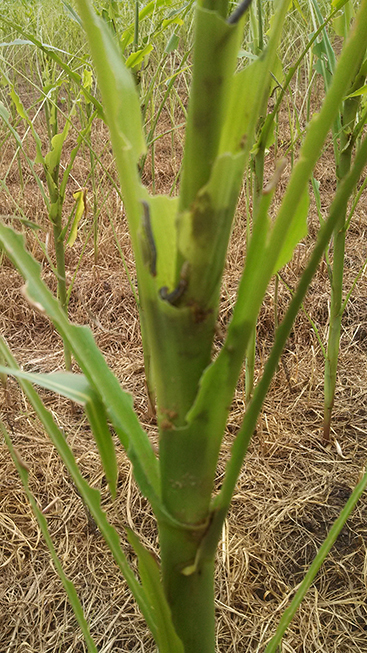 Armyworm damage north of Mauston. 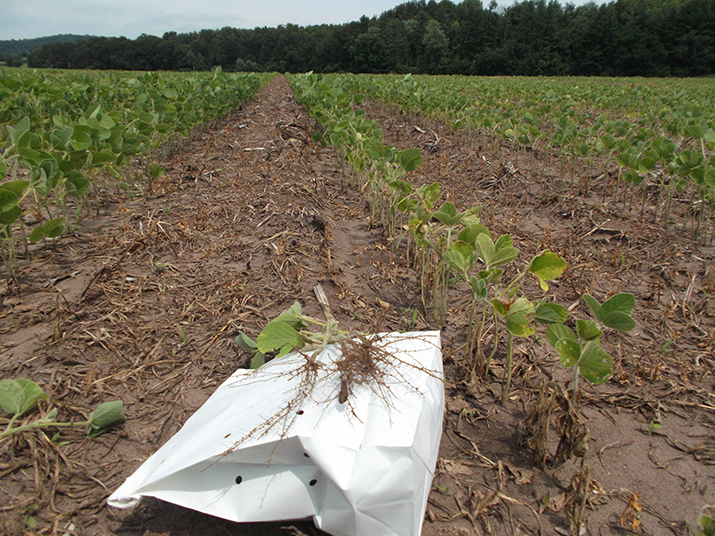 Today we looked at a number of soybean fields that have been attacked by a number of soil born diseases. Because of the extreme conditions this season – cool and wet, then hot and dry – a lot of fields are starting to show problem areas. The field pictured below in particular looks like it has some areas of rhizoctonia starting. We are sending some samples down to the plant pathology lab to confirm our diagnosis. Diseased area in soybean field.